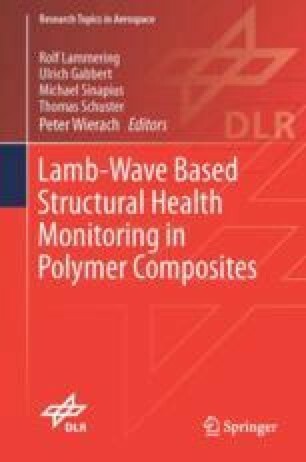 This chapter addresses aspects of Lamb wave propagation in CFRP plates and their interaction with different inhomogeneities and defects. Intrinsic inhomogeneities result from the manufacturing process combining rovings to fabrics or non-crimp fabrics and from the geometry of the structure. Some fabrics like twill even bring up ribs including certain angles with the warp and weft threads. Local geometric inhomogeneities result from design such as attached components or edges, holes or inserts. Such inhomogeneities, caused by the material and the geometry of the CFRP component, induce diagnostic signals in SHM and have to be distinguished from defects the SHM system should detect. The physical nature of both, the inhomogeneities and the defects, is the local change of the acoustic impedance of the plate. Therefore, both transmit and reflect parts of the acoustic energy of the incident wave. Differences in their behavior may be found in the degrees of transmission and reflection and in the occurrence of mode conversion. The following investigations are focused on generation, properties, and basic interactions of fundamental S0 and A0 modes with inhomogeneities and defects.